Ever find yourself just settling down in your seat at a restaurant and the waitress is quick to ask the question, "What can I start you off with to drink?" Unless you order the same thing everywhere you go, you probably start to fumble around looking for their drink menu and ultimately have to ask for the server to give you a few minutes while you read through the menu. One of the exciting features about our digital menus has been the ability for customers to interact with the menu by touching an item, allowing for more information with "real" pictures of what you may be ordering. We have tried to help that uncomfortable few minutes when you sit down by creating an entire page, with pictures, of different cocktails that you can choose from. 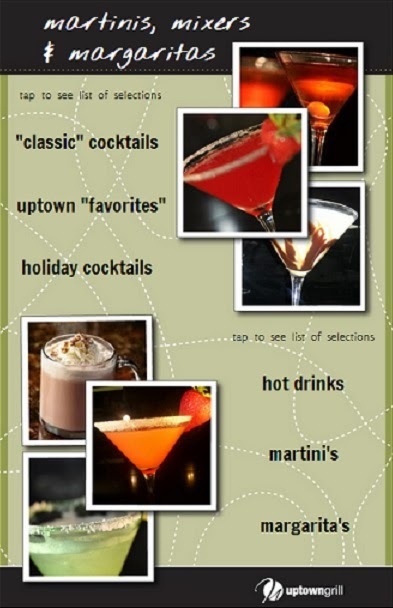 Our new drink menu page consists of 6 different categories of drinks (listed below) that you may be looking for. A simple tap of the menu on whichever category you choose will reveal the selection of drinks we offer. These are "the classics." The ones that you remember maybe mom and dad or grandma and grandpa always order. These are the original cocktails that were created many years ago and often times can be forgotten. You will find drinks such as manhattans, the negroni, old fashioned, side car, whiskey sour, moscow mules or cosmopolitans. Take a look at this page to take you back to the good ol' days... and now that you're old enough, enjoy a taste of what they used to drink! This section pays tribute to drinks that I, the bar manager, have seen grow over the years. What started out as special drinks that only appeared on the menu briefly, became the same drinks that people always seemed to ask for. So, they have made their way back on and tend to be the "go-to" choice for many repeat customers. Drink favorites like the sunset martini, strawberry cosmo, the mojito or caiprinha. What drink menu would be complete without a martini menu? Here you will find chocolate martinis, espresso martinis, french martinis and many more....yes, martinis. We have been preparing the same recipe of our version of this traditional Mexican drink for over 28 years. Enjoy it shaken or frozen! Or choose from other versions such as pomegranate, pineapple or strawberry. Yes, this menu is perfect for the season. A whole page of drinks that will surely warm you up. Using everything from hot chocolate, cocoa and coffee, a dash of grandpa's coffee syrup will add just that perfect kick to warm your chilly bones. Check this section out each month. You will find drinks featured for every holiday. Cocktails like the Christmas Punch and Peppermint or Mistletoe Martinis for December will put you in the holiday spirit! We have created this menu so you will be able find one of your favorites or try something new. Check it out next time you are in. Cheers!